Height Adjustable: Min 2.3 ft. to Max 6.5 ft.
Width Adjustable: Min 4.5 ft. to Max 9.8 ft. The background stands are made from aluminum alloy, giving them excellent strength for holding up any variety of backgrounds. Quick single action safety locks make set up a breeze. Easily change the height of the background stand with the quick adjustment levers. For simple storage and transport, the stand collapses easily and is very lightweight to carry. The stands are compliant with industry standards and can be used to support all major photo equipment including reflectors, softboxes, lights, umbrellas, backgrounds and more. 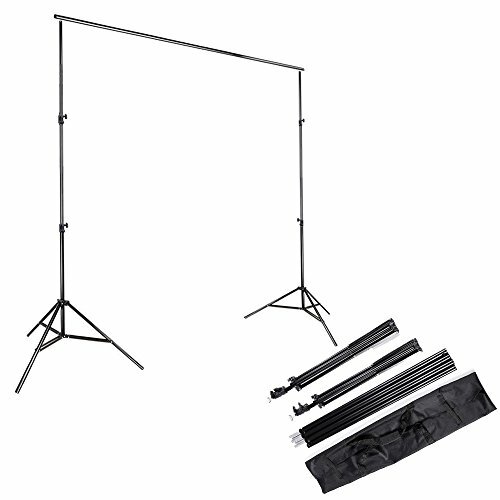 [1x] 6.6ftx10ft (2mx3m) photography backdrop background support stand kit. The adjustable background stands are made from aluminum alloy, giving them excellent strength for holding up any variety of backgrounds. Quick single action safety locks make set up a breeze. Easily change the height of the background stand with the quick adjustment levers. For simple storage and transport, the photo backdrop stand collapses easily and is very lightweight to carry. If you have any questions about this product by Kshioe, contact us by completing and submitting the form below. If you are looking for a specif part number, please include it with your message.